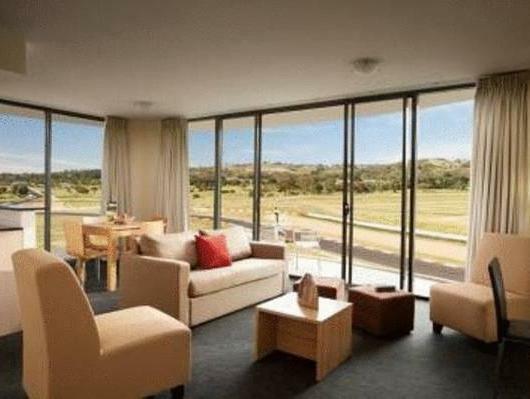 يشكل فندق Rydges Mount Panorama Bathurst بموقعه الممتاز في قلب Mt Panorama نقطة انطلاق ممتازة لاستكشاف باثهارست. يسهل الوصول إلى هذا الفندق ذو 4 نجوم من المطار، فهو يبعد عنه مسافة 216 km فقط. كما يمكن الوصول بسهولة إلى ‪National Motor Racing Museum‬, ‪Chifley Home‬, ‪Machattie Park‬. إن Rydges Mount Panorama Bathurst حريص على توفير الراحة للنزلاء، فلا يوفر الموظفون جهداً في تقديم أفضل الخدمات وضمان حسن الاستقبال. لضمان راحة ضيوفه، يقدم الفندق الخدمات التالية: واي فاي مجاني في جميع الغرف, مكتب الاستقبال على مدار الساعة, مرافق مخصصة لذوي الاحتياجات الخاصة, واي فاي في المناطق العامة, صف السيارات . لقد جهزت هذه الإقامة الفندقية بعناية فائقة لتوفر مستوى عالي من الراحة. في بعض الغرف يجد النزيل تلفزيون بشاشة مسطحة, اتصال لاسلكي بالإنترنت, حوض الاسترخاء, غرف لغير المدخنين, مكيف هواء. يقدم الفندق مجموعة رائعة من الخدمات كمثل مركز للياقة البدنية, حمام سباحة خارجي, سبا, ملعب تنس، لجعل إقامتك تجربة لا تنسى. 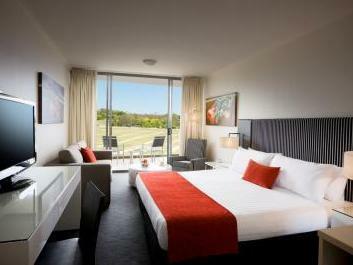 إن Rydges Mount Panorama Bathurst هو خيارك لخدمة الفنادق الراقية في باثهارست. Very lovely, comfortable and relaxing stay. Will stay again! Had a good time. The manager remembers me from a previous stay - that degree of attention makes me feel really welcome. We enjoyed the rooms and the breakfast was so quick and easy. Dear Maria, thanks for taking the time to provide feedback. Glad you enjoyed your stay with us! Beautiful place, but you pay for EVERYTHING but the view. Great Get away hotel. 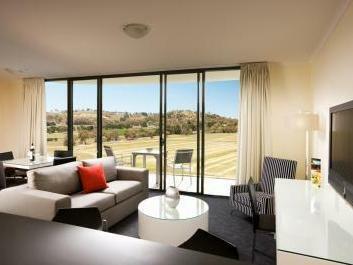 Lovely large rooms with 2 toilets, lounge, huge balcony & kitchenette. Bed & fixtures 5*. Cons: rooms face west so they get super hot in summer. Need transport to get to town. Pros: Bathurst 1000 memorabilia & race track to walk or drive. Overall a great experience. Premium price, average service and amenities. Ran out of toothbrush when asked, an okay experience. We spent 3 night at this Rydges Hotel. On check-in we found that the AC was not working in the double-room that we'd been allocated. The staff we helpful in moving us to another (larger) room on the 6th floor. They were helpful again, when we could not program the room safe. The lining room was being renovated, so breakfast and dinner was being served in the function rooms on level 7. This worked perfectly well. The hotel is right on the race track which anyone can drive on (at the 60km speed limit). Also close to the car museum which is recommended, and just a couple of km from the centre of town. I can recommend this hotel. Very good food for reasonzble prices. Buffet breakfast was also very good. Nice rooms, clean, spacious, comfy mattress and pillows, close to race track, free (mostly) secure parking, friendly staff. Only 2 complaints are: (1) No toothpaste or toothbrushes (2) The room we were in had a combined bath/shower that was FAR too small (but my being 2 m didn't help). Exceeded our expectations. Nice modern, clean room. Self contained studio has everything you need for an extended stay. 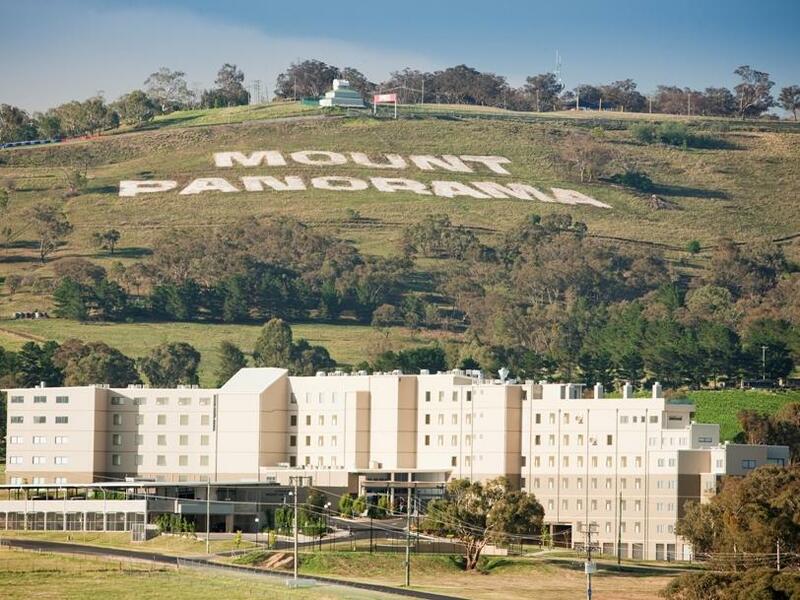 Dear Chenyu, thank you for taking the time to review Rydges Mount Panorama. Hope you'll visit us again sometime. Was only an overnight trip so didn't really get to look around or make use of the hotel facilities. Were very pleased with what we did see. Staff were lovely and we would definately stay here again. We stayed for one night and would have liked to have stayed longer! Very reasonably priced for the standard of accommodation, it was a different experience staying on a race track! Staff at both Reception and the bar/restaurant were friendly and helpful! Dinner and breakfast was 8/10! Would definitely go back to Rydges. A different experience depending on time of travel. Very clean and comfy room.